This movie is fantastic, loved the story and the characters. Where this movie loses points is in three separate continuous sequences of intense flashing. My sister is epileptic, and with no warnings we weren't prepared for any of it. She ended up seizing after the first sequence, and we had to cover her eyes for the their two. If you or any family members are sensitive to this sort of thing, AVOID THIS MOVIE. Since I already know you are going to rate this review as "Not Helpful" because I didn't rate this 10/10 stars, I figured I might as well start off by telling you how much I love the original Incredibles. The Incredibles (2004) is one of my favorite films of all time and is my second favorite Pixar film (right after Finding Nemo). I got to see Incredibles 2 early because I caught a double feature of the two films in IMAX, just in case you were thinking of complaining that I didn't see it since this review is out early. What I loved about the original was the authenticity that the story, characters, and animation had to it. It felt more creative, natural, and beautiful. Syndrome was one of the greatest superhero movie villains of all time, not because of the amount of damage he was able to inflict upon the world, but because of the emotional pain he was able to cause Mr. Incredible and his family. The moments in which Mr. Incredible regrets his past mistakes and realizes how his actions affect others, especially his former biggest fan, are what makes the film stand out from any other hero-villain dynamic. Sadly, Incredibles 2 does not have a villain or story as deep or as thoughtful as Syndrome.Incredibles 2 boldly and intelligently begins right where The Incredibles ended. This smart move on Disney Pixar's part eliminates all confusion and time gaps that may arise after a hiatus of any amount (especially fourteen years) between a sequel and its predecessor. The story that follows is relatively contrived and characters are clumsily introduced in order to expand the universe instead of expanding the emotions of the beloved characters. The action scenes are creative and well-animated, but they aren't memorable enough and take place in bland settings and accomplish nothing for the characters. There were many points during this film where I noticed how hard Brad Bird was trying to replicate the formula of the original film, but it became more and more noticeable to the point that it detracted from the story itself. The great Pixar films all have excellent, fluid stories. The great Pixar films also have superb plots that deepen our understanding and feelings for the characters. The good Pixar films have entertaining, sensible plots, but they rarely deepen our love of the characters involved in them, such as A Bug's Life, Cars 2 (don't hate me! ), Cars 3, and The Good Dinosaur. Incredibles 2, sadly, falls into the latter category that has a fun, creative plot, but a plot that does nothing new for its characters.Since the villain is introduced in the trailer, I don't think that it's a spoiler to say that it doesn't feel authentic or inspired enough to be considered one of Pixar's best villains. While the motive for the villain is there, it is simply unnecessary, contrived, and unexciting. New heroes are also introduced (as seen in the poster and other promotional material). Many of them are underutilized or unnecessary. The film's weakest parts involve the newly introduced characters because they all lack the liveliness and creative spark of the original characters that are explored slightly more deeply in this film. But enough of the aspects of the film that let me down. For all of the disappointments, Incredibles 2 also has many surprises and amazing qualities. For one, Jack Jack's new abilities are basically perfect, both in what his powers are and in how they are revealed. At first, I worried that too much of Jack Jack's powers were revealed, but that was hardly the case. Jack Jack is actually one of the best parts of this film. He is easily one of the funniest parts of any Pixar film. I couldn't help but burst out in laughter every time he made a single noise. The humor in this film is slightly more present, or maybe more memorable, than in the original. The film's message also tries to be more important and necessary besides highlighting the importance of family.Obviously this review won't stop you from seeing this film, nor was it intended to, but I encourage all of you to see this film in theaters, but heavily reduce your expectations and don't think too much about what made The Incredibles nearly perfect, or you are sure to be sorely disappointed. (I'll try to keep spoilers to a minimum) I really don't know what to say about this film.As someone who absolutely loved the first one and went into this one desiring to love it as well, I was extremely disappointed and just incredibly confused. I have a number of issues with it, but let's get into the first one.Tone: Not every film in a series/sequence needs to maintain consistent tone, I get that. But the first film has always stood out from other animated movies, because of its serious tone and mature themes (children and adults can enjoy it). This movie feels like a different franchise entirely. It lacks all the high stakes, emotion, and seriousness of the first film. Consider just a couple moments from the first film: the plane crash scene, the scene where Mr. Incredible threatens to kill Mirage, the scene where Buddy gives his "it's bigger, it's badder" monologue, the scene where Mr. Incredible realizes his fellow supers are dead and is then absorbed by black slime, or when Elastigirl considers that Mr. Incredible might be having an affair when she finds a white hair. Any one of these scenes is more complex, emotional, and interesting than the entire Incredibles 2 film. The second movie lacks any sense of stakes or seriousness. It felt like the most dumbed down version imaginable. The first film was so smart in its approach and dialogue, and the characters felt realistic and intelligent (the fight between Elastigirl and Bob when he comes home late). This film has lost all of that completely. For example, the scene where Elastigirl is talking to the sister and says "are you asking the believer or the cynic?" was possibly the most cringe-worthy, out of place dialogue I've ever heard. Like they were trying to intellectualize a moment so hard it just felt forced. Even the color scheme of this movie felt jarringly different and so saturated, like the colors were turned up to the max. The first film had a color story that made sense: it's grey and depressing when Bob is working, explosion of color once you get to Nomanasan. There's a development of color that is both metaphoric and makes sense. This film's color story felt childish, which would be fine if it was just a children's movie. But it's apart of a franchise that's first film was an iconic masterpiece with mature yet fun themes, and in that respect it is seriously disappointing and difficult to watch.Plot: Most predictable plot ever made. As soon as you see it, you know the siblings (sister) will turn out to be bad, and that she's controlling screen slaver. And of course Elastigirl finally gets her turn to save the world and Mr. Incredible + family will have to go save her (a reversal of the first movie that at first seems creative then becomes almost too predictable). And I have major issues with the villain. They are literally fighting people who can be calmed down if they just remove goggles. Characters: What happened with the characters? They were all dumbed down versions of themselves. Even that scene with Dash where he can't pronounce decimals, which was supposed to be family friendly and cute, was just irritating and felt dumb for his character. Elastigirl was over the top to the point where she didn't feel like herself. Bob was the... same? I guess, but had zero development. Violet, who I get is going through her angsty teen thing, is okay. Even the minor characters, Edna aside who was fine, like the guy who helps them relocate each year was off. In the first film I appreciated his seriousness and matter of fact style, which appeared cold but you could tell he actually cared. Even he felt crazy different. It actually hurts me to continue critiquing this film, so I'll stop there despite the many other issues I had with it. Following the superb 2004 original, the family of animated superheroes are back. This time, they are struggling to regain a good reputation for superheroes (ostracized due to the collateral damage of their heroics) while also getting caught up in fighting a scheme against Screenslaver, a villain who hypnotizes victims with TV screen images.The idea of Screenslaver seems clever and almost touches on the modern world's collective obsession with technical devices and other forms of media. It doesn't quite get to the heart of the matter and misses an opportunity to be a clever critique of our current times. The theme even seems to be jumbled and incoherent at times.But overall, the film is saved by funny characters and doing what action-filled, comical, Hollywood blockbusters set out to do: be entertaining. It also succeeds in adding a twist to the genre by having female characters in the centre of hero/villain conflicts. A rather smart move considering the current dynamic in the film industry. There is much to like here and not much that is outright wrong or bad. It's funny, fast paced, clever and overall works quite well. However there is an ever present feeling that the first one was better.. Maybe it's cause the plot is maybe a bit too predictable and cartoonish(yeah it IS a cartoon, but still..) or that the wait between the first and this one was so long and I expected something more? It's still good, just not great! Good: The animation for this movie was excellent just like most other Pixar movies, it was funny (especially Jack Jack) and I really liked the action sequences throughout the movie. I liked that the movie showed that parenting (when done right) can be heroic.Bad: I thought this film has quite a few problems, the biggest problem was that the ending was pretty predictable, I could see it coming. Also, there was a feminism theme with Helen which was okay but at times it seemed to shove it in my face and it got to be annoying. There seemed to be a little too much going on in the movie and a few too many characters.I'm glad I saw the movie, I just don't think I would see it again anytime soon. Half way through watching this in the cinema, I thought "maybe it's me". Maybe it's my fault I'm not into this movie. But I loved the original, so what's going on.No. The problem is this movie is a bland attempt to express messages about gender roles and current society issues. It lacks flow, it's just a bunch of scenes one after the other, there's no coherent thread or curious elements tying it together.Nice visuals goes without saying, but the story is let down by a sense that it's been engineered around a board room table by people referring to their social media feeds for inspiration, rather than dreamt up by talented writers.Sure, some scenes are fun. But we're not watching a youtube playlist here, this is a movie and it's supposed to work as a whole, not just momentarily.The script is uninteresting, the action is exciting sometimes, but other times you just want it to end or move on. Very disappointing.Toy Story 2 was a great sequel, but this is a very poor sequel. Forgettable.If you love the first, then hold onto that because it doesn't get better. It gets worse. It's just full of propaganda, I enjoyed it overall but almost every 10 minutes there was something new trying to brainwash me which I appreciated very little.The ambassador or whatever it was is a woman, that's fine. They added what seems to be some sexually ambiguous folk in there as well, which is also fine. They said Elastigirl is a better superhero than Mr. Incredible, they showed how great of a mother and super hero she is. Then they showed how crap Mr. Incredible is at looking after the house and everything in life to be honest, a complete disaster in fact.At the start they had to make sure Violets boyfriend tells us how he likes powerful women 'cause he's so secure in his masculinity or whatever. Two siblings run a major company, the brains behind the operation of couse, a woman. The parents of the two siblings died, yes, you've got the hang of it now, because the father was an idiot and didn't listen to his wife. The super intelligent villain, is that same woman. These are just some of the things I remember, but one of the scenes that really bothered me was a really short clip of a TV ad where a guy was baking a cake or something and the narrator said "so simple even HE can do it", imagine this scene but with a woman trying to fix a computer and the narrator saying it's so simple even SHE can do it, many people would be very upset.I thought the first movie was pretty equal, each member of the family was equally valuable, they all realised they needed each other. While the super intelligent superhero might have been a guy, the super intelligent superhero suit designer Edna is a woman. It all seemed pretty well balanced. I'm just shocked the judge at the end wasn't a black woman as well to be honest.I'm all up for having women with the more significant roles in a movie but this is just an overload to the point where it's blatantly obvious they're trying to brainwash us through a screen, which reminds me a lot of the villain of the movie, peculiar... The message I took away from this is that we're best off just getting rid of men because women are perfect. I guess that's what equality means now a days. They took the women are Superior than everyone else approach and ruined the movie. All the other supers are idiots, Mr incredible can't take care of the kids. He's now dumb lazy and helpless without his wife. It's a real disappoinment, they didn't incorporate depth into the movie. My kids wanted to see the bad supers use their powers more, but that was detailed with supers that are men and portrayed as lazy, uneducated morons. The lead bad person is a women with no super powers of course. "Incredibles 2" was probably the most anticipated movie of the year; it's hard to believe it's made 14 years since the first original. So obviously everyone was more than ready for this.The film does come through when it comes to entertaining action and comedy, with Jack-Jack, Bob, and Edna providing most of the biggest laughs. The plot is interesting, because we've got to know what happened to the Parr family. As far as the supervillain mystery, it's acceptable and somewhat entertaining, but a bit predictable and generic. The final criticism I have is that Edna definitely deserved more screen time.That being said, it is still an entertaining movie and not at all "painful" to watch.In conclusion, "Incredibles 2" is funny, exciting, and really worth a viewing. Nice storyline....but i think Mr. incredible is in little bit lower side! frozen is most effective superhero. but they showed over feminism. but i enjoyed the funny scenes specially Jack Jack's part & the suspension. The Incredibles return in the highly anticipated sequel that fans have waited for 14 long years to arrive in theaters. The first Incredibles released in 2004 was a masterpiece of filmmaking for it's time and is part of Pixar Animation Studios's Golden Age of films along with past iconic titles Toy Story, Monsters Inc., and Finding Nemo. What these films have in common is how they were able to touch the hearts of audiences across the world, as a result becoming cult classics. In the past, Pixar has produced sequels to their films from time to time, with the Toy Story franchise being the most popular and with the next sequel Toy Story 4 scheduled for a 2019 release, the franchise continues it's success. Cars and Finding Nemo both have had relatively decent sequels but this one was highly desired for the last fourteen years. That being said, there hasn't been nor will there ever be a case when a sequel to an adored iconic film is released that audiences especially fans of the original who hold it dear to their hearts will not perceive the sequel at first glance as inferior to the original. That can damage a film's reputation. Incredibles 2 does look different (the animation literally looks different) and yet is similar to the first film with a new twist. It's habit of bringing back the nostalgia that made the original loved is it's biggest strength. The film picks up right where the first film ended with the first superhero family facing off with the villain the Underminer giving viewers the idea of the kind of film their about to watch. One thing this film does well is develop each character's powers to new levels. For an animated film, the action sequences are thrilling, sometimes heart pounding and super fun to view. The music is similar to how it was before giving exciting 60's spy movie vibes. The best moments of the film are the ones where Bob Parr/Mr. Incredible is watching over his children while his wife is away saving the world, something we did not see in the first film was his relationship with his children. The theme of wanting acceptance in a world that hates you is back, a relatable subject in today's world for some people, and just as in the first film, it's presented well. Incredibles 2 is an enjoyable action packed superhero fest with a coming of age aspect to it. All the characters are under pressure by the world around them that's telling them how they're supposed to live their lives creating sadness and desperation for them. As time goes by, they must choose what they want to be. Pixar has always included deep emotional topics like this in their films all to their credit. Finally while the additional characters new to the film may not have been the most memorable Pixar has invented, it had an interesting story, entertaining action, a final act that pays off, humorous moments and seeing the characters return made the film worth the wait. It doesn't completely live up to the original though nonetheless it is a worthy sequel to one of the most successful animated films in history. I cannot believe it has been 14 years since The Incredibles came out. The gap between sequels seems to be getting longer, but the director, Brad Bird, said he wanted to wait until he had the perfect story. There's even a clip before the film starts where actors, Craig T. Nelson, Samuel L. Jackson, and Holly Hunter tell us it will be "well worth the wait"--and they were right!Though 14 years later, the film takes place minutes later. The first film ends with the Parr family having to fight the Miner who pops up out of the school parking lot, just after Violet gets a date with Tony. The sequel starts with that fight and we see how it backfires as the Parr family get arrested for destroying part of the city and because superheroes are still illegal. Enter our new characters, siblings Winston and Evelyn Deaver, who both want to help superheroes step back into the light, but they believe the way to do that is with Elastigirl. Therefore, our sequel twist is that Mr. Incredible becomes a stay-at-home dad having to babysit Jack-Jack and learning of his dozens of powers, teaching Dash "new math", and inserting his foot into his mouth when he tries to help Violet with her crush--all while Elastigirl is improving superhero relations. Personally, I thought the movie was predictable but perfect. I loved it for its simplistic plot that was not hard to figure out. I knew right away who the "villain" was and what their motivation was; however, I did not know exactly how the climax would occur, so I was still very much engaged. Not to mention there was enough character development and funny scenes to space out the predictable plot arch. Often times animated films are more for the adults who are taking the kids, then for the kids themselves. Most kids will not understand half the references, but will still enjoy the overall concept. At the same time, this film comes out when the kids who saw the first are now adults, possibly with kids of their own. Therefore, this film is a great blend of adult and child humor. I found it hilarious, and as a teacher, I particularly loved when Mr. Incredible stays up all night reading Dash's "new math" textbook so he can teach him new math, which was what it was called in the 60s (the time period this film alludes to) and is a shout out to our modern common core confusion. What I really love about this film is that there is even more Frozone and Jack-Jack, which brings me to my all-time favorite scenes--learning of Jack-Jack's powers, particularly when Violet and Dash call Uncle Frozone over because their dad is going insane from sleep-deprivation and trying to keep up with Jack-Jack. I lost track of how many powers he has and all I will say on the matter is that the best scene in the whole film is when Jack-Jack fights the raccoon. If you want a light-hearted comedy with some fun action sequences then this film is for you. If you loved the first one then you will love the second one. If you have not seen the first one, what's wrong with you? 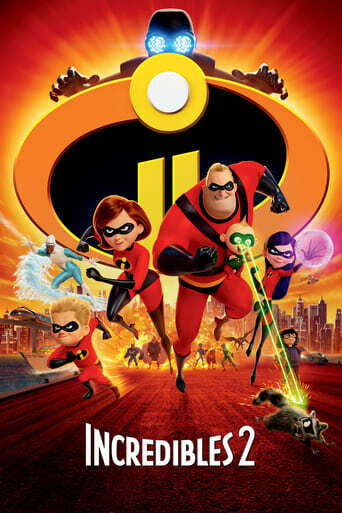 Downloading Seeding Incredibles 2 (2018) [WEBRip] [1080p] [YTS.AM] from to 0 peers.